COTTAG3: one down...dining room finished? My dining room is finished! Or is it? Let's say it's finished for now. 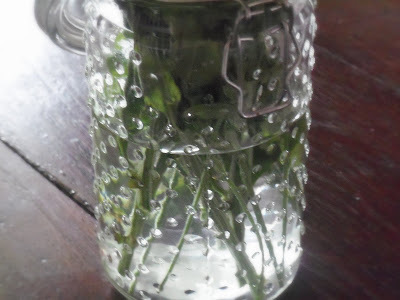 I will also add here that this post is chock full of pictures so grab some sweet iced tea, kick your feet up and have a look. This English pine pie rack has been in an entry way for most of it's time at my house (it's travelled around several rooms). At Jennie's suggestion, I moved it in the dining room and filled it up with stuff I had all over the place. Let me tell you about this little thing. There are two that are almost identical. They were pulled out of a hand built large shed on my husband's family's property. They were old weathered wood when we got them. However, we got them in the mid-90s and I put that little stencil on both. I now despise that little stencil so I painted these babies. I didn't sand or prep or prime but just painted over it so it will look like it has ages of paint under one fresh coat. You can see them on either side of the pine rack above the chairs. The actual makeover of these will be a future post. 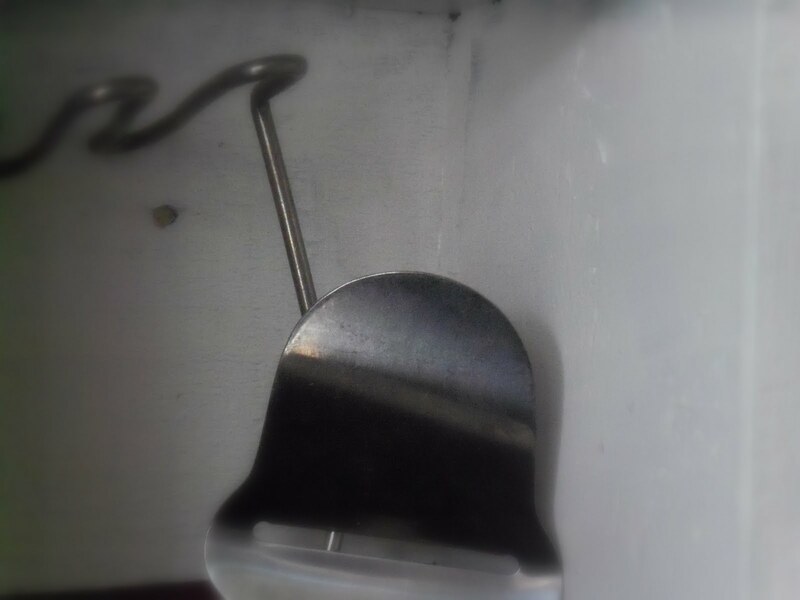 I put some vintage kitchen utensils in them. Love this jar with it's bubble/hobnail like glass. It's not old. I think I got it at HL or Target or some place a few years ago. I know they are hung a little asymmetrical which is challenging my very mild autism spectrum tendencies but I can always add more. In fact, I've got my eye on some tin butter pats that would look great added here. The dining room looks out onto the front porch. So, why am I not declaring it 100% finished? I like those white painted wood shed things so much and I think they would look lovely in a bathroom with rolled up towels in them or in my craft/project room to be as storage. My husband thinks we can recreate them so we may give that a try. If we're successful, then this room is finished. What do you think? I may link it up to my favorite blog parties listed below on the right or above in my list. Next up: Entry room part A&B (you'll see what I mean). I'm starting tomorrow but it won't be finished for awhile. I have a lot of little projects to do for that area. I'm sure I'll post about the little projects. I'm so thankful for their service. Oh, where do I start? It's all so cool! That pie rack~holy cow! It's awesome, and it really fits that wall. I love all the accessories, too. I really like what you've done. I love how the pie rack ties the top and bottom of that wall together so the wall seems unified, with the star relating to the goodies on the pie rack. I love your slight ASD tendencies and can totally understand how mixing up that wall of plates would be hard to do - I have some of those same issues. In fact, I love all the changes you made. By the way, have you tried some of that blue sticky tack behind the wayward picture. It took me a few years to figure that out but it works well. Our pictures would go crooked every time the lead-footed teenage boys came down the stairs - now no more. 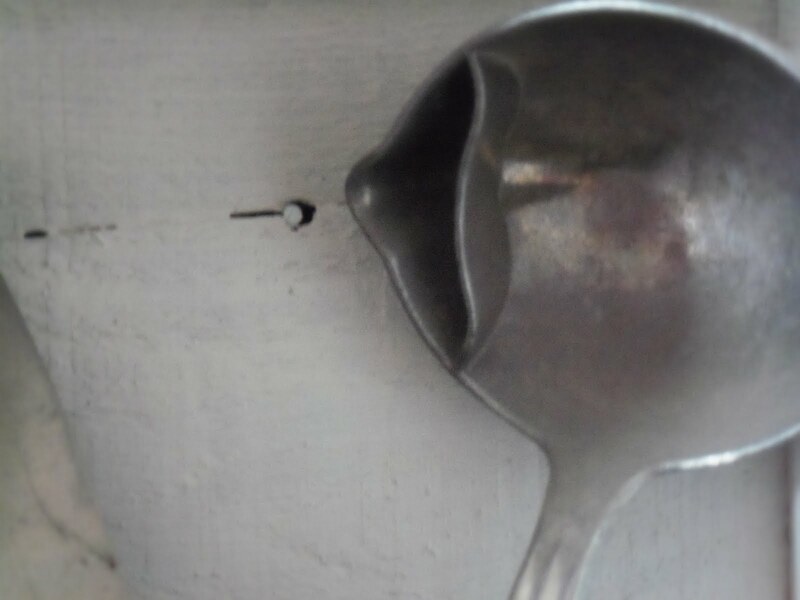 You've got a great collection of vintage finds. Looks good! It looks fantastic. The pie rack and the painted boxes add so much more interest to the room. And I like the asymmetrical plates! That was so really well done. 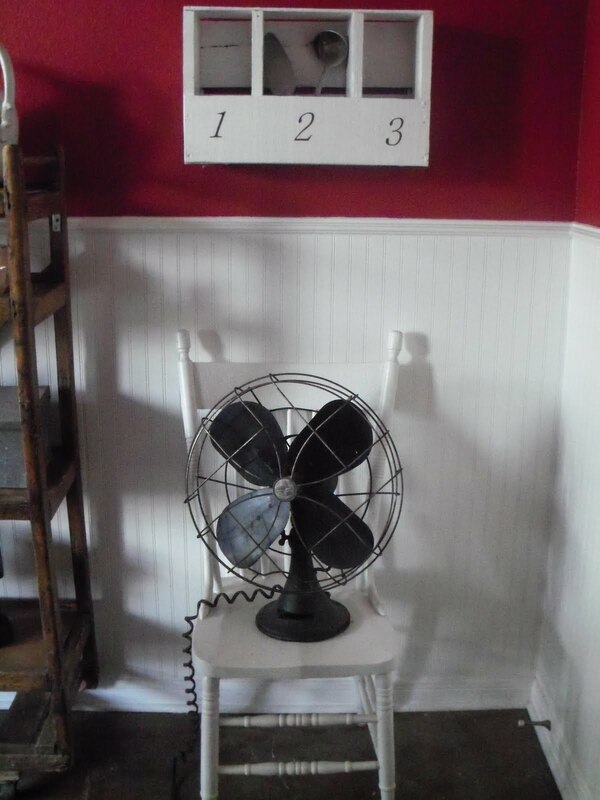 Lovin' that "COOL" old fan and your beadboard! I love it! So bee-autiful. All your finds in there. . . holy cow. I dream of one of those things, let alone all of them! Great job! I love what you have done. Red is my favorite color and I love vintage everything. Great Job!! 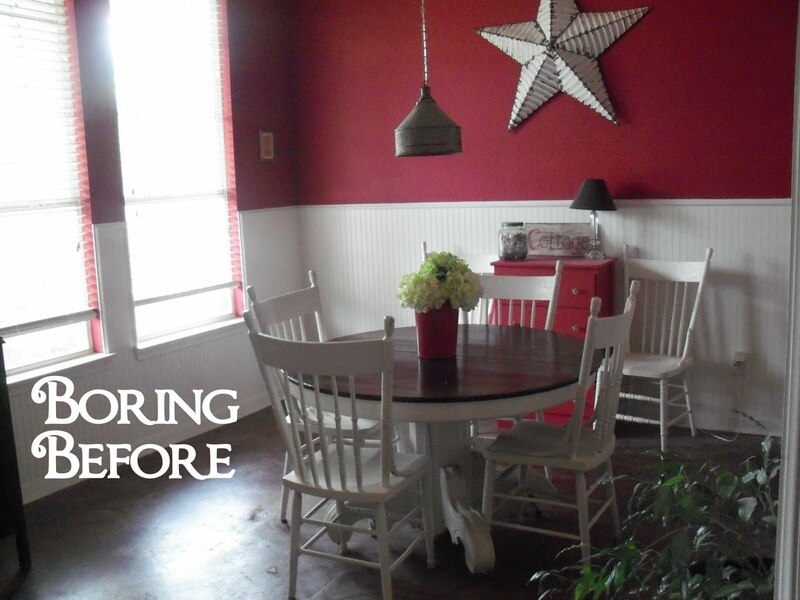 Your dinning room turned out beautiful and I just love all the old antique pieces you have and how you displayed them. Great Job!! It turned out beautiful and I love all the rustic this you have in there. It looks great! I love all the little details and collections you've added. Love it, very nice! My favorite thing is your kitchen table! You are some kind of sorcerer -- fantastic work as usual. Those shelves on the wall would probably be too heavy for me to carry; I don't know how you did it. That pie rack under the star truly fits the space better in terms of scale and balance. 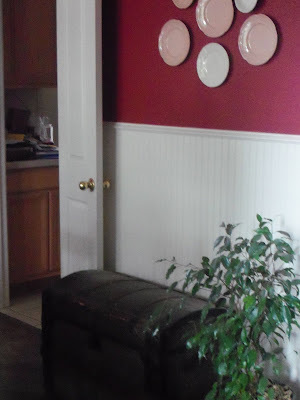 And the little matching pieces you repainted on either side also help balance that wall. 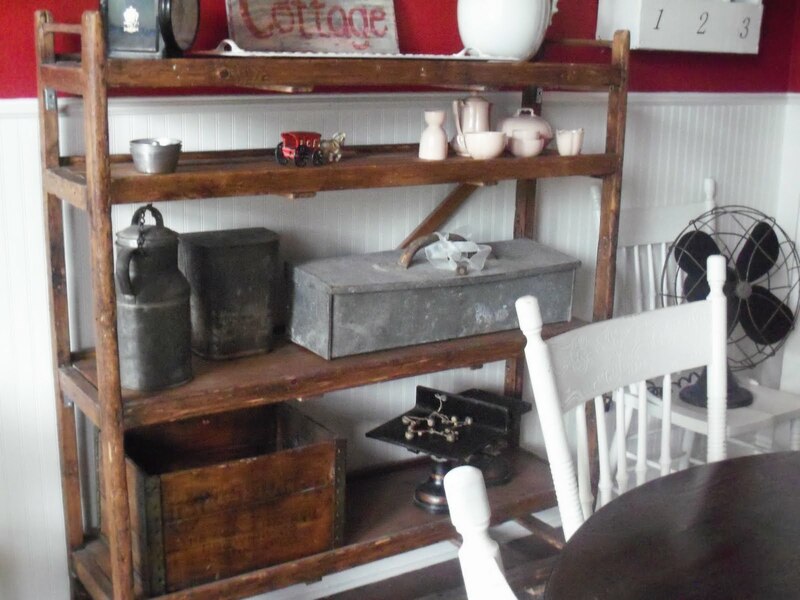 All of your vintage items add a true "this space has real character" essence to the whole room! Nice change! I love how the larger display shelf really made your star pop out so much more and look so much larger! Wow! You have a great collection too! Thanks for visiting me and your sweet comments! Love, love, love ...everything about this!!! I love your dinning room! so much charm! What a great room! I love all your vintage pieces! I am following from Coastal Charm! I really like the "after"!! It is a nice change that has more character and shows off your great items! I think it is fabulous. RED is one of my favorites in decorating. 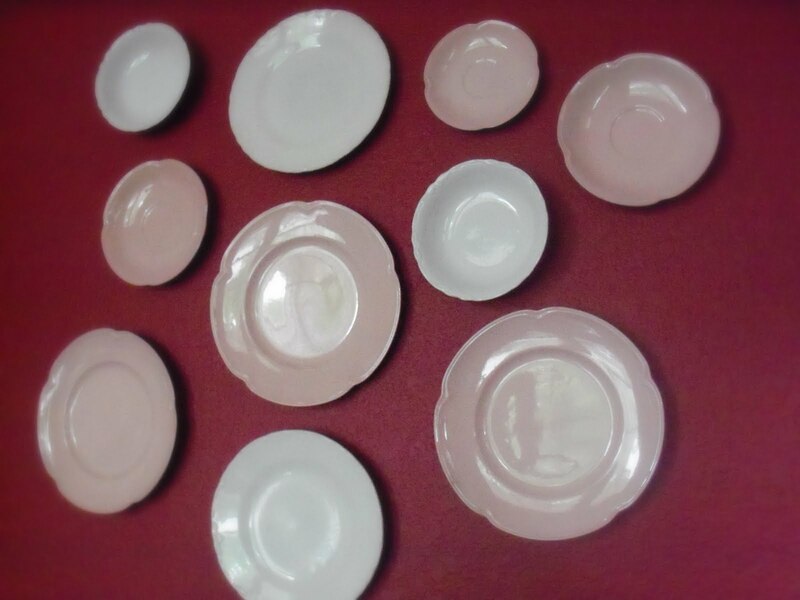 I am in the process of collecting plates for my kitchen wall. 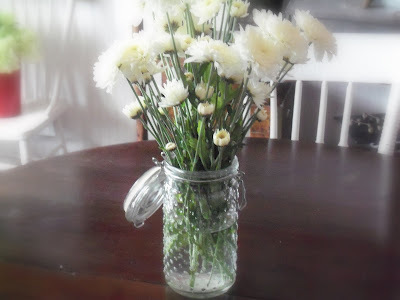 June will be tough to do anything I have three wedding flower jobs! Maybe my stress relief will be my plate wall. 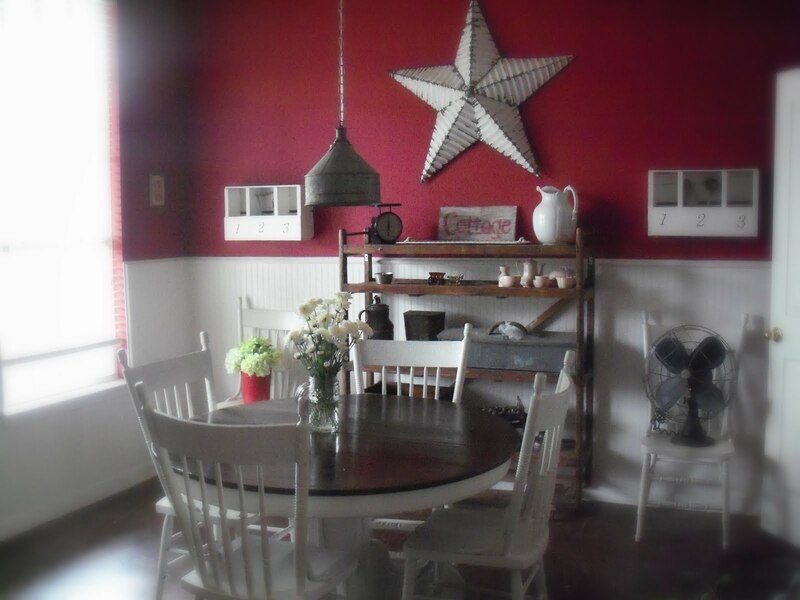 Your dining room is so inviting, I love all the vintage touches you added, just gives the room an overall homey feel. Great job! Looks great! You have some wonderful pieces and have arranged them very nicely. Thanks for sharing! Nice. I like those shelve things too and they would look nice in a bathroom with towels! Hope you figure out how to copy them! I love how you pulled it all together. It makes me think I need to find a shelf of some sort for our dining room to display all of the wonderful treasures we've accumulated but haven't yet displayed! I especially like the little shelves from the barn that you painted. They are adorable and I think they'd look great in the bathroom too. Your kitchen and style is freakin me out! seriously! I have a kitchen in transition, with paint swatches painted on the wall in those colours, a basement full of awaiting antiques to go in it and miraculously enough your kitchen and what I envision my kitchen *dining room* to be are almost twins.....your house is and apirition of my mind in real life....I can't believe it! Wow, what an inspiring makeover!!! Love the vintage items. Love that Farmhouse French Look! Love all of your new little touches! They make a big difference! What a fabulous makeover!! When is the magazine shoot?!! 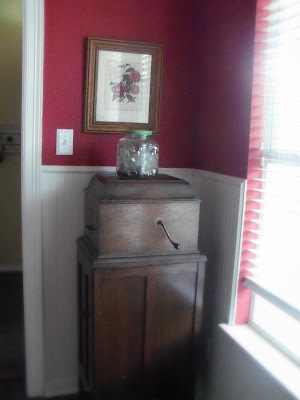 The pie safe is wonderful. I love the dark wood against the white. I had recently posted my living room and said I was going to paint my coffee table/chest white but I think I am going to refinish it in a darker stain now! Very happy I stopped by! 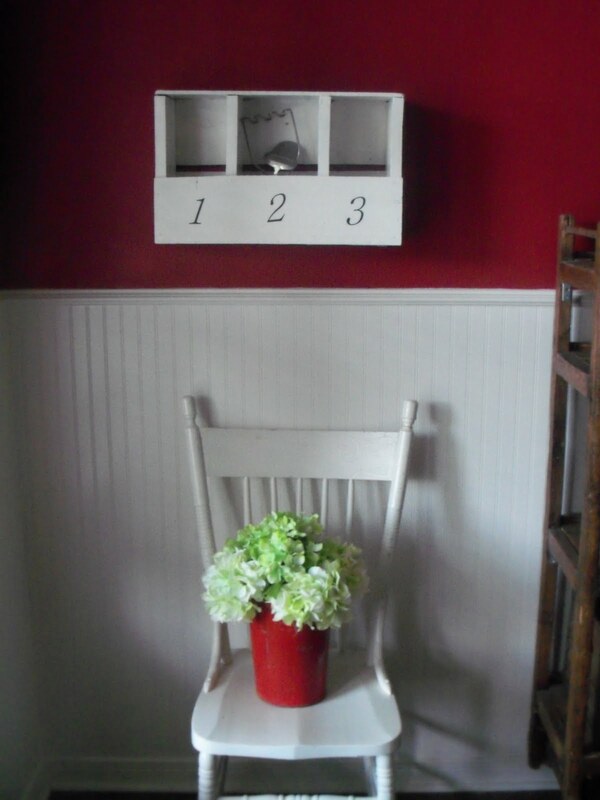 Love, love, love the textures of those weathered pieces with that crisp white and rich red! It's LOVELY! I AGREE,we do have similar taste! I'm in love with soooo many things in your dining room...the scale, the old boxes you put the numbers on, the pie rack, ummm I don't think I can name them all! Thanks for becoming a follower, I'm certainly going to do the SAME! I ALSO APPRECIATE YOUR SWEET COMMENTS ON MY BLOG! ...just a bit blonde here! Be still my heart~your English pine pie shelf is gorgeous! I would love to find a beauty like that for my kitchen. You have some lovely pieces there and your room looks great. The room looks fantastic! You a lot of great pieces and you've displayed them well! I especially love the fan in the chair-Nice! Great job! It looks great! Love that wood shelf - adds some warmth to the room. And your accessories are great! Your dining room is so CHEERFUL! I love it. I'm just amazed at how you took fresh, modern things - red paint and bright white furniture - and paired them with vintage and antique pieces...but it feels cozy and warm and chic, not incongruent. I think a lot of people might not have that special touch. Beautiful! Everything looks so charming and welcoming. Nice job. I really like that pine shelf. This is my first visit to your sweet blog. What wonderful additions you've made! Isn't it funny how just shopping our home, moving and re-purposing some items makes all the difference. 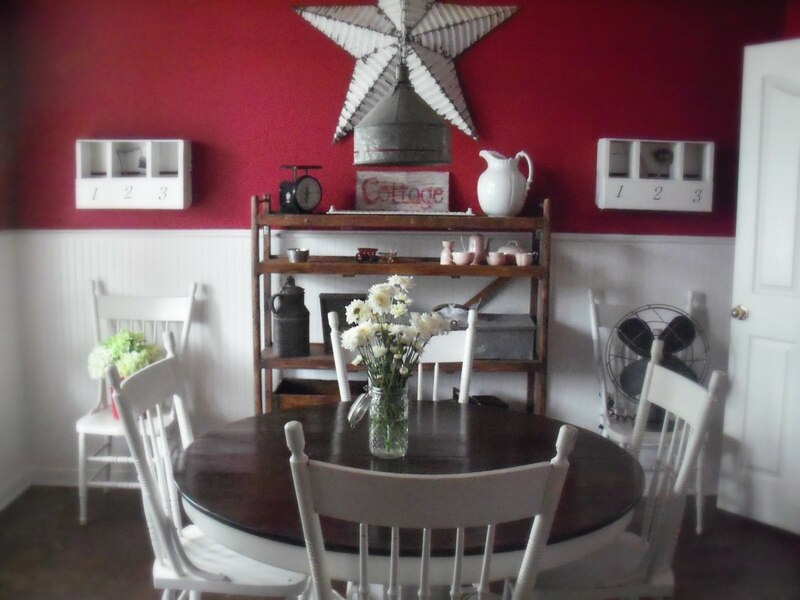 I love the English pine pie rack and the two crates you painted and hung on the wall. Beautiful job! Ahhh yes. The taller shelf gives the room an enhanced focal point you can see beyond the table and chairs. And your stuff on it.. pure fun! I LOVE your light! It's all so wonderful, but I especially love those white, numbered boxes and your ceiling light fixture...awesome!! Gina...I have glanced at Etsy but I'm an instant gratification kinda person. 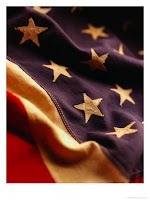 Lots of good stuff on ETSY...I'm addicted! Looks so good. I love those little shelf thingy's you painted and numbered! So cute. I am so in love with your light too!